Symmetrical mode: If the corresponding jumper is not set both VCAs of the crossfader have the same 50% amplification with zero CV. If the applied CV becomes positive the amplification of VCA1 decreases and those of VCA2 increases in the same way. A negative CV has the opposite result. The CV voltage range to obtain the maximum/minimum positions of the crossfader is about -2.5....+2.5V. This mode is useful for bidirectional (i.e. positive and negative) control voltages, for example LFO or joy stick (adjusted to 0V CV in center position). Asymmetrical mode: If the corresponding jumper is set VCA2 is fully closed and VCA1 has full 100% amplification with zero CV. If the applied CV becomes positive the amplification of VCA1 decreases and those of VCA2 increases in the same way. 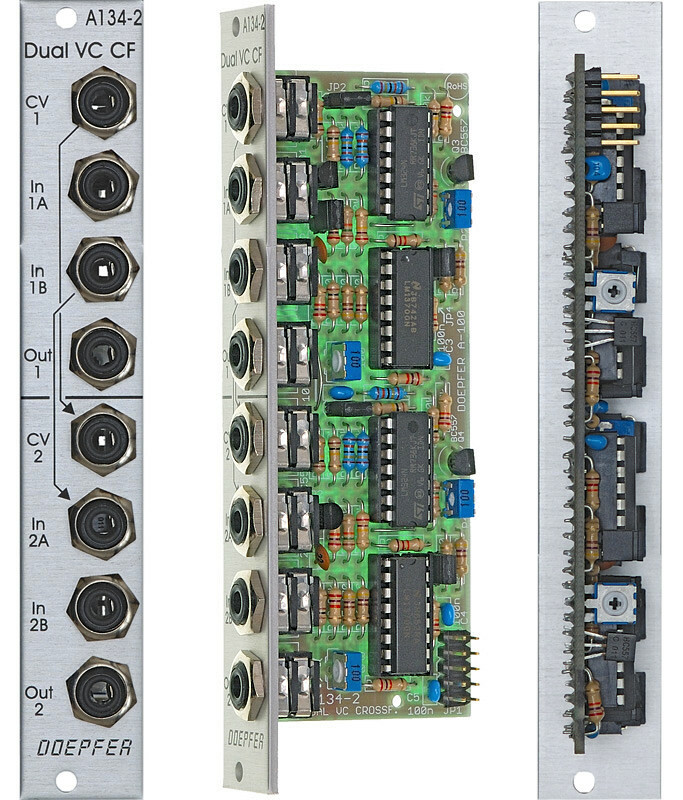 The CV voltage range to obtain the maximum/minimum positions of the crossfader is about 0....+5V. A negative CV has no function in this mode. This mode is useful for unidirectional (i.e. 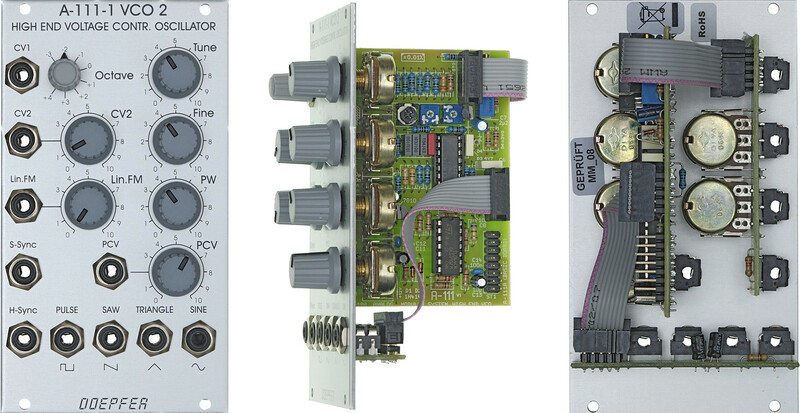 only positive) control voltages, for example ADSR, ribbon controller or Theremin control voltage. common output Out 2 for both units: JP4 and JP5 installed, JP6 removed and the pins of JP4 and JP5 have to be connected (as jumpers are installed to JP4 and JP5 it does not matter which of the pins of JP4 and JP5 are connected). In this case the socket Out 1 has no function and Out 2 is the sum output for both units! Technical note: Actually the module does amplify the signal "In 1" by about 1.5 (or about 4 dB) instead of 1 (0 dB) when the control voltage is 0V in the asymmetrical mode. As well signal "In 2" is amplified by 1.5 when the control voltage is about +5V. In other words the amplification of the VCAs is in the 0...1.5 range rather than the usual 0...1 for other VCAs. If the range 0...1 is necessary attenuators can be used at the inputs (e.g. A-183-1). JP6: this jumper has to be removed if the outputs of both units are mixed together. In this case the upper output socket has no function and the sum of both signals appears at the lower socket. For this application the jumpers JP4 and JP5 have to be connected in addition with a short isolated wire (it does note matter which of the two pins of JP4/JP5 is used as both are connected with a jumper).